I would like to inform you of a very important and serious incident that is about to take place in Texas prisons very soon, and will go unnoticed if the media don’t report on it. There is not much said on the news about prisons, specifically Texas prisons. The government tells the public, “We are waging a war on crime and on drugs.” They use and manipulate crime rates for political reasons. Truth is, people don’t understand or care about crime rate statistics or prisoners. All they care about is unemployment and taxes; not knowing that the “prisons” issue affects these very problems. The public see prisoners as a burden for the law-abiding tax paying citizen. What they fail to see is the root of the problem, who creates it? and the reasons behind it. The roots of the American Factory System of Criminal Justice, as with so many developments in American political life, lie with Richard Nixon and his pursuit of Southern conservatives, particularly the followers of George Wallace, as a path to long-term political success for the Republican Party. President Nixon’s “War on Crime” and his subsequent “War on Drugs” had a transformative effect on our criminal justice policy. Between 1970 and 2005, incarceration rates in the United States rose by 700%. Today, the U.S. locks up almost one-quarter of the prisoners in the entire world. Of note, while crime rates were increasing at the time that the War on Crime began, the explosion in the prison population has continued unabated in the ensuing decades through periods of falling crime rates. Due to the current economic turmoil in America, numerous states are experiencing tremendous difficulties meeting their fiscal budgets. Federal, State and local government agencies are cutting programs in numerous departments (i.e. Department of Education, Defense, etc.). Numerous states are even forced to consider releasing thousands of prisoners and closing select prisons in an effort to combat the current economic recession and make progress towards closing their budget gaps. Several states have authorized or have pending legislation for the release of prisoners as a method for meeting their budget shortfalls. Instead of covering the massive cost of imprisonment, states are relying on electronic monitoring and community-based programs to supervise and correct those who have committed crimes. These methods are being employed throughout our nation. From state to state, coast to coast, states are considering the release of prisoners as a viable option to lowering and meeting their budgets, EXCEPT TEXAS! The state with the second largest prison system (120 prisons, 180,000 prisoners) in America, is actually looking to expand its prison system and population, even during these dire financial times, because the prison system in Texas is a cash-laden Industrial Complex! Under the guise of being “self-sufficient,” Texas prison officials created an industry called “Texas Corrections Industries” or “TCI” in 1963, where free prisoners’ labor is utilized to make all types of products, from hand soap to bed sheets, from raising livestock to making iron toilets and portable buildings, all for sale. Free prisoners’ labor also maintains the water recycling and purification system for all Texas prison units. TCI is a “Publicly Traded Stock” on the New York Stock Exchange, making Texas Prison System the only prison system you can buy stock in. Throughout Texas’s 120 prisons, TCI operates numerous furniture factories that make all sorts of residential, commercial and office fixtures (i.e. sofas, tables, desks, cabinets, etc.) that goes directly to the open market. In addition, the metal fabrication factories that exist throughout Texas prisons, build metal residential and commercial furnishings that mostly go straight to the open market. The garment and textile factories that are also operated by TCI’s free prisoners’ labor, make all types of clothing attire (shirts, socks, jackets, uniforms, etc.) as well as bedding materials that are sold on the open market as well. There are slaughter houses, meat packing plants, where all the livestock that are raised on the grounds of Texas prisons are taken to be slaughtered, prepared and packed for selling on the open market. The meat is sold while prisoners are being fed with the leftovers mixed with soybean. All these factories and plants are operated on the backs of prisoners who are not paid. An investigation that was conducted by the Dallas Morning News a couple years ago, revealed that the furniture factories alone, produce nearly 90 million dollars (annually) of revenue (income) for TCI. Now consider the grand total of all revenue income when combining TCI’s industries altogether, 700 million?? 1 billion?? And all on the backs of prisoners who are not being paid nor given credit for that labor. Considering these facts, no wonder why Texas doesn’t want to decrease its prison population. Why downsize a thriving and lucrative cash-laden business? I haven’t mentioned the other entities of TCI, like out-sourcing prisoners’ labor to other open market companies, which I’m sure produce millions more dollars annually. This explains why more than 50% of Texans have a friend or family member in prison, or have done time themselves. Texas is not full of criminals, it’s full of corruption in its “Criminal IN-Justice System.” From cops all the way to District Attorneys and Judges, the criminal system is corrupt. They keep a high conviction rate at any cost, all for the well-being of the multi-million dollar Prison Industrial Complex. Immediately after the creation of TCI and the “Publicly Traded Stock,” Texas’s prison population exploded. I wonder how many Judges, District Attorneys and government officials (or their family members) own stock in TCI? One would think there exists a conflict of interest or even “insider trading” when the people who hold stock in a prison industry company, are the very ones who control prison sentences and populations? Wouldn’t you think it’s a criminal act to convert a place that was designed for punishment and correction, into a multi-million dollar industry? HOW DOES THIS PROBLEM AFFECT US? Many Texans complain about the burden of prisons when they should be asking, who is profiting from inmate free-labor? Certainly all those millions of dollars end in the pockets of just a few. What about the unemployment in Texas? Sixty percent of the 180,000 prisoners work. That’s about 100,000 jobs. Texans should be demanding that the state give those jobs to citizens. Those 100,000 new jobs would alleviate the unemployment rate in Texas. What about the corruption? Law abiding citizens don’t care about corruption or criminals until we or a family member becomes one. We usually think that cops, D.A.s and Judges are honest, when the reality is otherwise. Texas has more innocent people behind bars than any other state. The Texas criminal system kills more people than any other state. It has been proved beyond doubt that Texas, time after time, had wrongly-convicted, incarcerated and put to death more people than any other state. Former Texas governor Rick Perry killed more than 30 people on death-row, some of them innocent citizens that were victims of this corrupt system. Rick Perry is a true serial killer. These are the things we should be worrying about. Most people think that they are on the safe-side because they are not committing any crime; well, they are wrong, Texas can make a criminal out of a saint. Cameron Todd Willingham, Gary Graham, Ponchai Wilkerson, Kevin Kincy, Derrick Frazier and Francis Newton, just to name a few, were wrongly convicted and still yet put to death by the Texas Criminal IN-Justice system. And what about the thousands of wrongly convicted people that are currently serving long sentences in Texas prisons, now working as slaves? That could be me, you or anybody! Human and Civil Rights are not allowed in Texas prisons. There are so many violations to these rights on a daily basis, but we don’t hear about it because those violations, if fought against, rarely make it to the court. What about the slavery case? We don’t hear about it in the media because it’s politically incorrect to talk about it. The truth is that “slavery” it’s very much alive and thriving in Texas. It is being disguised by the TDCJ. Texas has the largest slave trade in the world. 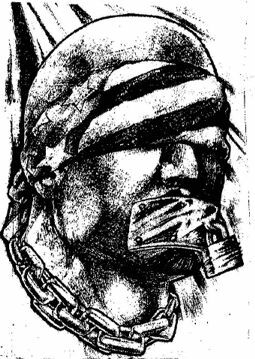 The Universal Declaration of Human Rights specifically states that “NO ONE shall be held in Slavery or Servitude.” It does not say “No one, except prisoners.” Critics often argue that the 13th Amendment abolished slavery “except as a punishment for crime.” It is true the 13th Amendment allows that – but that doesn’t mean involuntary servitude of a prisoner is morally right or justified. While the 13th Amendment allows slavery only “as a punishment for crime,” we should note that not a single prisoner currently incarcerated in Texas, has being sentenced to “hard labor, or involuntary slavery – servitude” but they are being enslaved on top of their sentences. Every convicted felon goes through the judgement process; if found guilty, then he/she goes through the “punishment” phase. The punishments go from probation, community service, restitution, etc., to more harsh punishments like jail or prison time, or death penalty. Judges and juries have the leeway (according to the 13th Amendment) to punish a criminal with “slavery or servitude,” but nevertheless, not a single criminal presently incarcerated in Texas has received such a sentence. TDCJ has taken upon itself the authority of punishing prisoners with slavery ON TOP OF THEIR SENTENCES, violating therefore, their Human and Constitutional Rights. It is about time the United States, and especially Texas, honor these Human Rights. The reason why I am today mentioning this issue to you is first, to create awareness with Texas citizens of the abuse, corruption and danger that the Texas Criminal System presents to all of us, free and slave. And secondly, to let everybody know that Texas’s prisoners are the slaves of today, and that slavery affects our society economically, morally and politically. They are forced to work on a daily basis, if they refuse to work a single day, they are punished in many different ways. They work without any payment. They don’t get any credit for their work neither for their good conduct. I have a brother in prison and will not mention his name for his safety. Even in 21st century America, prisoners still get beat up and even killed by prison guards, and they make it look like an accident or a suicide. Don’t fool yourselves thinking that this is not your problem; this issue affects all Texans. Since Texans are not aware of this situation, prisoners are doing their part; they have been organizing since last year, a peaceful State-Wide Work Stoppage. Beginning on April 4th, 2016, all inmates in Texas will stop all labor in order to get the attention from politicians and Texas’s community alike. This work-stoppage will affect the pockets of all those who benefit from prison slavery. We need to be clear about one thing, prisoners are not looking for a lazy life in prison. They don’t want to spend their sentences sitting in a cell, eating and sleeping. They still will attend every education-rehabilitation and training program available. They are not against work in prison – as long they receive credit for their labor and good conduct that counts towards a real parole-validation. I said “real parole” because the present Texas Parole Board is a joke. The Texas Parole Board does not care about the rehabilitation of prisoners; all they want is to keep a high prison population in order to keep their slavery business rolling. What we see and hear on the news media and what TDCJ advertises on its web site is far away from the truth. Please report on this issue! Thank you.